Nighttime motorcycle accidents in California, including Los Angeles and other urban areas like San Diego, Orange County and the Inland Empire are a huge problem. Too often, the convenience, economy and adventure of motorcycle riding comes with a deadly price. After the sun sets, the risks increase further for riders who take to the road with the barest amount of physical protection. In the darkness, any number of things can cause a potentially deadly accident. Potholes and road hazards are obscured. Motorists don’t expect to see cycles at night, and many drivers aren’t educated on how to safely share the road with these two-wheeled vehicles. California has a unique problem. Thanks to fair weather throughout the year, it’s always motorcycle season in The Golden State. Statistics show that fewer crashes occur in December and January. About 20 fatalities are recorded in each of these months. However, during the rest of the year, the figures are nearly double. For example, approximately 48 motorcyclists die every October. National statistics show that motorcyclists are 26 times more likely to die in a crash per mile traveled than occupants of passenger vehicles. Nighttime is the most dangerous time to be a motorcyclist. Roughly 60 percent of fatalities occur after 6 p.m. It’s also important to note that 93 percent of motorcyclists involved in fatal crashes were wearing helmets. Statewide, cycle registrations increased 5 percent, yet deaths increased 23 percent. In Los Angeles, fatalities increased 59 percent between 2010 and 2012 according to the Statewide Integrated Traffic Records System. Experts say high gas prices are making cycles more attractive to new and experienced riders alike. Many tourists come to southern counties to rent cycles and explore the scenic roads. These drivers generally aren’t experienced, and they aren’t familiar with the local area, which makes them more likely to be involved in serious collisions. The dramatic increase in wrecks means that more attorneys are working to recover compensation for victims who suffered grievous head, neck and brain injuries. According to the Insurance Information Institute and the National Highway Traffic Safety Administration, motorcyclists are three times more likely to be injured on the weekend between midnight and 3 a.m. when compared to the same time on weekdays. In the 9 p.m. to midnight timeframe, injury crashes more than doubled during the weekend. The increase in these collisions is much less dramatic between 6 p.m. and 9 p.m. because many cyclists are active at this time during the week. Nearly 20 percent of all injury crashes occur in the early evening. Fatalities are highest between 6 p.m. and 9 p.m. This is followed by the 9 p.m. to midnight timeframe. During the weekend, midnight to 3 a.m. is the most dangerous time to be riding a cycle. Fewer than 5 percent of fatal crashes occur between 3 a.m. and 6 a.m.
Motorcyclists put their lives on the line every time they ride, but the odds are even worse at night and after dark. Low visibility is a major factor in all injury crashes and fatal crashes that occur at night. As a general rule, collisions involving cycles are more likely to occur on secondary roads, such as the Pacific Coast Highway. These scenic roads appeal to thrill-seeking cyclists, but they are also inherently dangerous due to the rolling hills, curves and various geographic features that obscure visibility. Nighttime crashes are also more likely to involve alcohol, which is just one of the reasons why many serious collisions occur at night. Passengers and riders can suffer debilitating injuries in a single-vehicle or multiple-vehicle crash. Even with a helmet, riders frequently experience disfiguring lacerations, contusions, road burn, broken bones, spinal trauma and head injuries. Riders have a right to be on the roads at any hour, but it’s important for all motorists to obey traffic rules, observe oncoming vehicles and follow the speed limit at all times. There’s no excuse for traffic safety violations that endanger lives. Motorists who cause such collisions may be punished according to the state’s vehicular manslaughter laws. Victims also have a right to recover compensation for medical expenses, rehabilitation and lost wages in a civil trial. If you were injured while riding on local roads, contact a Los Angeles motorcycle accident lawyer to discuss your case. Motorists should be held liable for negligence and reckless driving. You can also recover compensation in a wrongful death lawsuit on behalf of a loved one’s estate. An experienced attorney will investigate the cause of the collision and help you recover the compensation that you deserve. 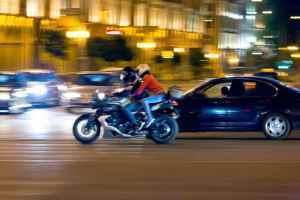 Whether your nightime motorcycle crash happened in Los Angeles, Contact a lawyer today to discuss your case.